The rules of the "sandpile experiment" are fairly simple: The model essentially consist of a grid of quadratic fields, similar to a checkerboard, onto which sand grains are dropped randomly. Fields that end up with fewer than four grains of sand remain stable, but when more grains accumulate on a field, it becomes unstable and topples. In such a toppling, four grains of sand are passed on to the four neighboring fields: one to the top, one to the bottom, one to the left, and one to the right. This might cause the neighboring fields to become unstable and topple, which then in turn may cause the next neighbors to topple, and so on—an "avalanche" results. Similar to real-world avalanches in the Alps, these "sandpile avalanches" have no characteristic size, and it is extremely challenging to predict if the next sand grain will cause a huge avalanche, or nothing at all. De to the simplicity of these rules, the sandpile model is regularly used as an easy example in elementary programming courses. But it nevertheless displays various mathematical and physical phenomena still unexplained today, despite more than 30 years of extensive research. Among the most fascinating of these phenomena is the appearance of fractal sandpile configurations. These fractal sandpiles are characterized by self-similar patterns in which the same shapes appear repeatedly, but in increasingly smaller versions. The occurrence of these fractal patterns has yet to be explained mathematically. 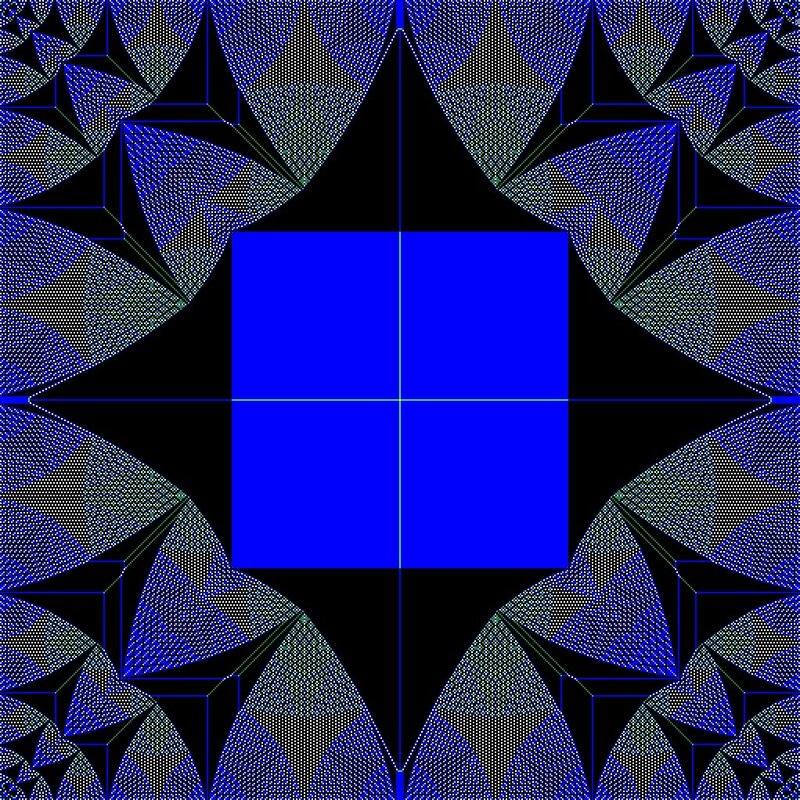 While the researchers at IST Austria did not solve this mathematical riddle, they rendered the phenomenon even more mysterious by showing that these fractal patterns can seemingly continuously transform into one another: They were able to capture video in which the fractal patterns display dynamics that are, depending on the background of the observer, either reminiscent of the movement of real-world sand dunes, or of psychedelic movies characteristic for the 1970s. Deepening the mystery of a mathematical question may not be the ideal outcome. However, the two scientists, Moritz Lang and Mikhail Shkonikov, believe that their "psychedelic movies" might be the key to a better understanding the sandpile model, and maybe also of many other physical, biological or even economical problems. "You could say that we have found universal coordinates for the sandpile," say Mikhail Shkonikov. "Essentially, we can give every sand dune in the desert a very specific identifier." Moritz Lang, who is a theoretical biologist, adds: "The key to understanding any physical or biological phenomenon is to understand its consequences. The more consequences we know, the harder it becomes to develop a scientific hypothesis that is in agreement with all those consequences. In that sense, knowing all possible sand dunes and how they move represents a lot of constraints, and we hope that in the end, this will remove sufficient hay from the stack such that we can find the needle." The two researchers see many applications in real-world problems like the prediction of earthquake magnitudes, the functioning of the human brain, physics, or even economics: "In all these fields, we find haystacks that look similar, very similar. Maybe it turns out that all haystacks are the same, and that there is only one needle to find."